★Convenient to carry and store. Easy to be cleaned and dry quickly after being wet. Easy to carry and pack with the same color sack. Strong hammock with stand weight up to 120Kg. 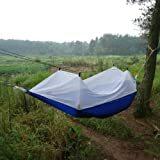 ★This jungle hammock with mosquito net is great for those who don’t want to carry a tent but want protection from insects. ★[Safe and Dependable] — The hammock is robust, strong, and durable. You’ll never need to worry about safety using it. ★Suitable for Camping, traveling, hiking, holiday use,Also for home uses in your backyard and patio etc. ★[Make Leisure Inescapable]– Our outdoor hammock make relaxation automatic and leisure all. Leave your job and your worries behind while you unwind and enjoy a fun and relaxing time. ★★★★★Portable High Strength Parachute Fabric Hammock Hanging Bed With Mosquito Net For Outdoor Camping Travel Blue&White/Army Green/Camouflage 3 colors for your choice! ★★100% Brand New & High quality. ★★Made of light weight and high strength Parachute Fabric materials. ★★Convenient to carry and store. ★★Easy to be cleaned and dry quickly after being wet. ★★Strong hammock with stand weight up to 120Kg. ★★Easy fixing, just fix the hammock with 2 binding strings and tie the strings to trees or poles. ★★Suitable for Camping, traveling, hiking, holiday use,Also for home uses in your backyard and patio etc.